Bespoke Bandages (BB) is now under new management, we will be carrying on as before and keeping the majority of products. However we are excited to be introducing some new products to BB from our partnering business VB Products (VB). VB is offering some fantastic pet products including pet blankets, dog coats, dog toys, dog leads and that's just mentioning a few. These products are now live in our shop! Along side Daisy we will be sponsoring VB Equine Show Team. They will be kitted out in BB products: Bandages to keep those white socks clean, rugs, saddle pads and more all to add that extra professional touch. Our partner business VB Products also sponsors Stuart Doughty Agility , a local and successful Dog Agility Trainer. Stuart uses all our dog coats, toys and much more for all his dogs. Stuart and Becky his wife also wear our clothing range. Check out there page for more information and updates. Any information you require please message us through our facebook page or our contact form. We look forward to the future as the new owners of Bespoke Bandages. Happy New Year to all our customers and readers! Our first blog of the year is from international show jumper, and Bespoke Bandages sponsored rider, Remy Ellis, who reflects on 2015 and looks forward to an exciting and busy 2016. "I’ve had a slightly quiet end to the 2015 season with my top horse Jack having a few months off in the summer but I have had some good results with him at the winter Premier Shows including Solihull, Aintree and Addington. ​Lucas, my lovely 6 year old, also jumped some super rounds before being sold in November to a top junior rider progressing from ponies, so he should have an exciting future ahead of him. With my team being a bit on the small side, I made a very exciting new purchase in Holland: a beautiful 4 year old mare by Zambesi X Papilon Rouge. She is a lovely addition to the yard and jumped double clear in both her classes at her first show with me coming 2nd! I cannot wait until February as I am off for an incredible 6 weeks of jumping on the Sunshine Tour in Vejer in southern Spain, so all the horses had a bit of relaxation time over Christmas before I begin getting them all in top form ready for the trip! In the meantime I still had my HGV driving licence to pass and another horse to buy to take with me so unfortunately didn't get much rest myself over the Christmas break!" All images reproduced here courtesy of Remy Ellis. You can read more about Remy in our sponsored riders section or follow her on Facebook or Twitter. To find out how you can get stable drapes and rugs personalised with your own name, logo or imagery visit our bespoke options web pages. A personalised gift perfectly combines thoughtfulness and uniqueness. As the self-appointed experts in bespoke horse accessories, here's our top 5 shouts for a this year's Christmas list. 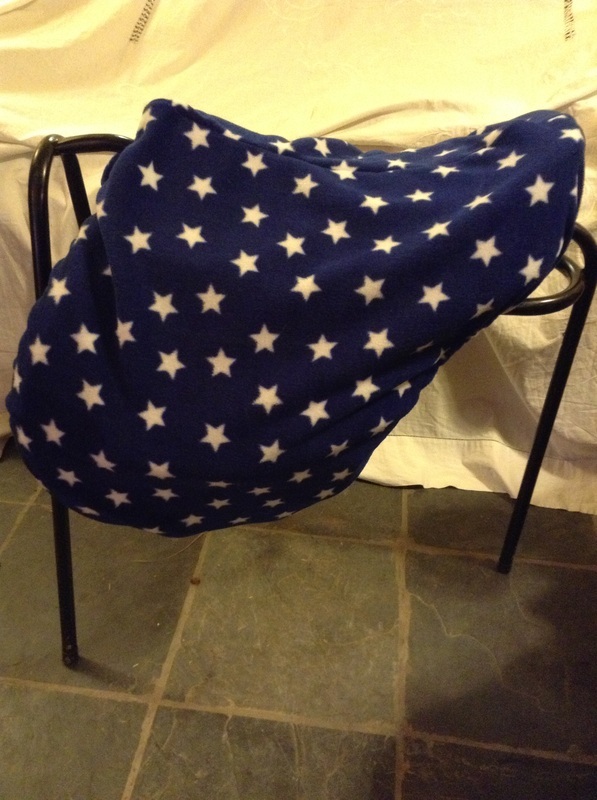 Essential for protecting your saddle through the colder months, a brightly patterned fleece saddle cover also brightens up the tack room on dull days. Our saddle covers are made from high quality fleecy fabric that ensures your saddle remains scratch-free. We have a variety of colours and patterns on offer - including these festive stars - and the option to add embroidered initials or a logo. Perfect for extra warmth in mild conditions, travel or layering up in winter, a fleece rug is great for year-round use. 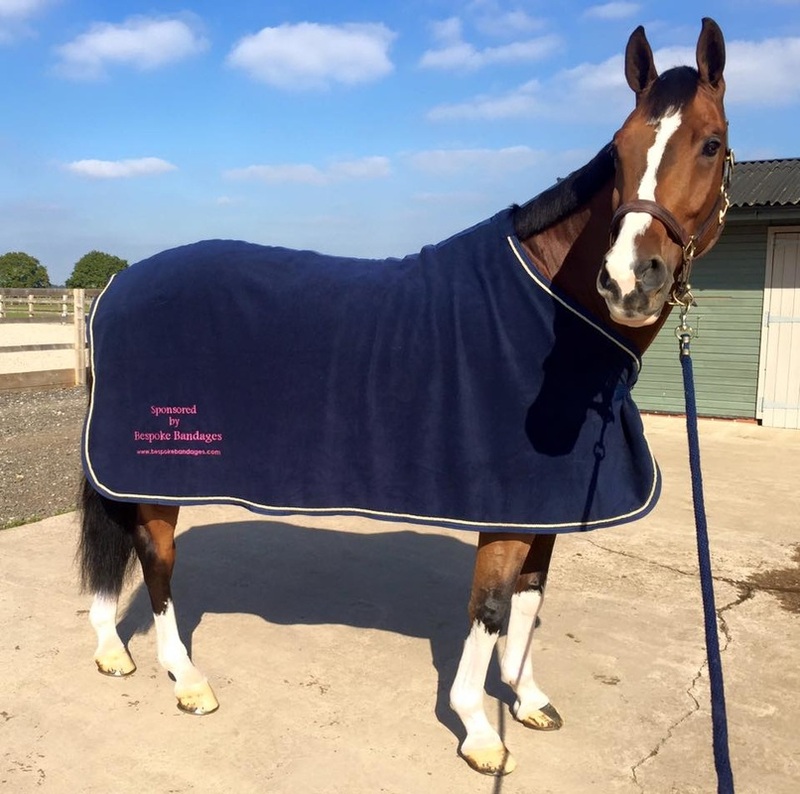 Made from hard-wearing, soft-feeling fleece in a variety of bright colours, you can choose to have a rug embroidered with initials or a logo for a truly professional-looking present. Designed to fit around your saddle while you ride, an exercise sheet is an essential piece of kit if you're out in all weathers or showing over the winter. 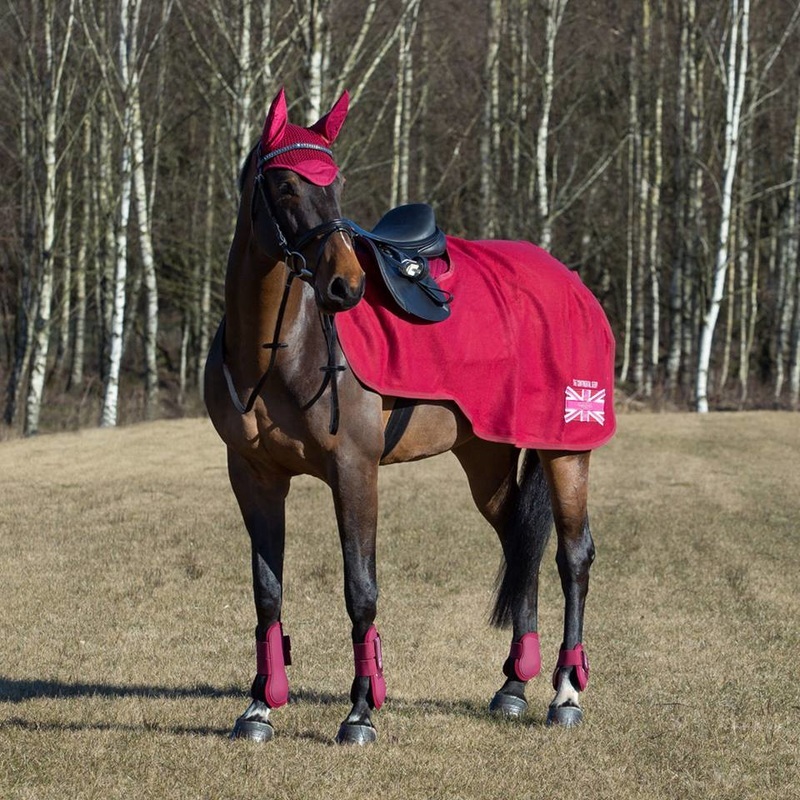 For the rider who has it all, why not choose from a fleece or waterproof exercise rug in a new range of colours for autumn/winter 2015/16 and add some embroidery for personalisation. Saddle pads are a core piece of equipment for any rider, and if you're out and about regularly you really can never have too many! Available in a range of styles and cuts to suit different saddles and tastes, our saddle pads can all be personalised with embroidered initials, logos or patterns. The ultimate in personalised gifts, why not get a bespoked set? Popular sets include our signature bandages with matching saddle pad, or a saddle cover, fleecy headband and set of bandages. Incidentally, our fleece headbands are available in child and adult sizes, with £1 from every sale going to our Triple the Warmth charity for 2015/16 All Because of Freda. AND they're a fantastic way to keep your ears warm around the yard! So plenty of reasons to add one to your order. We're happy to work with you to develop a unique personalised gift set - please contact us. If you're still looking for inspiration view our Christmas Gifts store page or follow us on Facebook. Season's Greetings from Bespoke Bandages! It's autumn, which at Bespoke Bandages means Triple the Warmth! Each autumn and winter we raise money for an animal charity through sales of our Winter Warmers range. This year our chosen charity is All Because Of Freda. All Because Of Freda was established by Isle of Wight based Karen Ledger, who, after adopting a dog - Freda - from Cyprus, felt compelled to take action to improve the lives of the many abused and neglected dogs there. "After adopting my beautiful Freda and putting my life on hold to help her building confidence in the human race, I realised that I just had to do something to help more of these dogs," explains Karen. "I decided on a sponsored dressage test, which I'm hopeless at! My aim was to raise £500 to rescue Cody, a blind pointer who had been shot in both eyes because he was no good at hunting. Thanks to many friends and acquaintances from the world of showing, plus local horsey people, a staggering £3,500 was reached and All Because of Freda was born." Karen is now able to use the money raised by All Because of Freda to support other dogs in Cyprus needing help. "Since then over 60 dogs have found homes through Freda, with many lives saved. I have adopted two further girls from Cyprus, Edith and Esta. I'm hoping to reach my £20,000 goal by Christmas," says Karen. "I'm so very proud of my brave girl." For every sale of Bespoke Bandages' fleecy headbands, snoods, and under riding hat ear warmers, we donate £1 to All Because of Freda, to support their work in rescuing, caring for and rehoming dogs from Cyprus. Find out more about All Because of Freda on Facebook or on the charity's website. Bespoke Bandages owner Lorna Cartlidge also runs her own stable, Playn Acre Farm, which produces horses, ponies and riders for the show ring, show jumping and dressage. Here, we meet Lorna and talk about the inspiration, perspiration and satisfaction that comes from working with horses. What made you decide to start your own businesses? I was inspired by working in the show jumping industry in the UK and abroad. Every professional rider or stable has their own ‘livery’ colours and logo, and kits out their whole team. So when you’re at a competition you often don’t need to see a rider's face before you know who it is from the colour of their saddlecloth or jacket. I wanted to extend this to the everyday rider and create a new take on it with personalised bandages. I was particularly inspired by the way americans use their monograms on their riding gear and wanted to bring this ‘fashion’ to the UK; you'll notice an abundance of initials on Bespoke Bandages' products! Running my own stable has been my dream since I was about 11 and, after gaining valuable experience working on professional yards for 10 years I decided to take the plunge. I love working with young horses and ponies and seeing them fulfil their potential. To do it as a job is extremely rewarding and makes me very happy. Tell us about your background with horses. I was very lucky to be able to start riding aged 3. Then from age 11 to 15 I was able, from time to time, to help my aunt break ponies in Ireland. I left school at 16 and worked as a groom at James Fisher's stable in Reading, from 19-22 I worked for Billy Twomey, the Irish show jumper and I have also worked forn Mclain Ward (who won Gold for the USA in the show jumping at the Athens Olympics), and Swiss show jumper Clarissa Crotta. Just prior to returning to the UK to start my own businesses, I was riding young show jumpers and dressage horses in Germany. I feel I've taken the best from each place that I worked before in order to develop my stable and create my own workplace. I like getting up and being active, starting the yard, making a plan for the day. I enjoy the different challenges horses and ponies throw up for you and how you can learn from each and every one. I love being outside and being at horse shows! And what's the most challenging thing? There are never enough hours in the day! Sometimes we are our showing the whole weekend and it’s tough to keep up with everything. What do you like most about your two businesses? I like that Bespoke Bandages' customers are so creative and individual. It's a pleasure to make other people's ideas a reality and to receive all the positive feedback from my customers. With Playn Acre Farm, I enjoy being with the horses each day and being the boss! I would like to expand Playn Acre Farm to new clients with new ponies and a (slightly) bigger team. 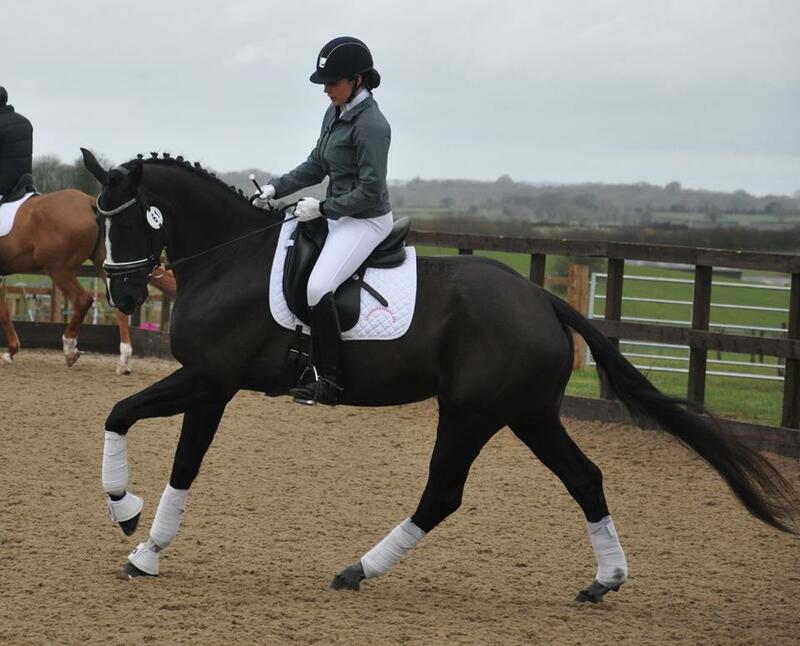 It's been a super busy start to 2015 for dressage rider Daisy Jackson, one of Bespoke Bandages' Supported Riders. Here she tells us about the ups, downs, and more ups of the last few months, and how horses Tango and Blackberry have her excited for the future. "Lots has been going on this last few months, starting with the graduation presentation for the Advanced Apprenticeship in Sporting Excellence (AASE) which I completed last year. I was presented my certificate by Nick Burton my mentor and coach who I worked with throughout the course. It is such a super qualification to have and has created more brilliant opportunities for me as well as developing my knowledge and experience within the sport and industry. I was fortunate enough to be picked for this course as 1 of 12 out of 80 applicants, of which only 4 of us were dressage riders. The presentations took place in front of the audience for the Eventing Forum at Hartpury College (pictured above). Now to prepare for my UKCC! "I have been lucky enough to have the opportunity to start taking Blackberry, Tracey Bywater’s beautiful mare, for training with Gareth Hughes. I was so excited as I knew Gareth would have lots of invaluable advice relating to mares and how to tailor your riding in order to get the best results with a girlie. The best quote to take from the lesson is very simple but proving true ‘‘with a mare you have to tell them they’re beautiful’’, meaning that mares particularly thrive on praise and reward and do not respond to being nagged! "The day following my lesson with Gareth, I took our beautiful Blackberry out to our first ever party together to do the Elementary and Novice Open classes and had great fun. In the first test Berry was very tense and spooky in the indoor but I got her round and we came 3rd. By the second test she was much more relaxed and I had more of an idea of her reactions and was delighted to win the class on 71.61% especially as it was quite a big class! "This past month has by far been the best month I’ve had for a very long time! Now training and competing harder than ever, the hard work put in by all of us at Team Jackson and the support team behind us is paying off massively. It is such a rewarding feeling." "Blackberry has really starting to settle at competitions and tries her upmost to grab the judge’s attention as the little diva loves to show off! Despite a small mishap during our second lesson with Gareth Hughes where Berry decided to do her own thing with or without me on board, she has gone on to win both Novice Open classes entered with 70%+/71%+ and also come in the top 3 for the Elementary Open class with 66%+. The most exciting is a score sheet with 10 x 7.5’s and 6 x 8’s when I know there is so much more to come. I am so pleased with the rate that she is progressing and Gareth made it quite clear that the improvement is extremely noticeable already. At our last competition, Tracey came to watch and support us – I was a little nervous as I really aspire to do Berry justice; it made my month to hear Tracey say she was “over the moon” with us and is excited for our future together! I couldn’t be happier! "Then it was Tango’s turn at showing off in front the judges as we took him to Kingston Maurward for the first time last month. Despite having not been out yet this season Tango behaved well and warmed up on good form . I did the Elementary Open as a warm up test which he won and he then went on to come 2nd in the Medium Open Qualifier with 70%+. This is a personal best at this level and I am especially excited as once again there is so much we can improve on to hopefully get the scores up higher. "My last bit of news is that I have just attended my first trainee judge seminar with a view to becoming a listed judge. I am also now fully insured and will be taking on clients in my local area and offering my services for training clinics. "I am so ecstatic with how everything is progressing and the results we are achieving which I know is also down to our wonderful support team around us who are doing an amazing job to help attain results to be proud of, not least of which is Bespoke Bandages who give us the ultimate professional look." You can keep up to date with Daisy, Tango and Blackberry on Facebook, Twitter or by visiting the DJ Dressage website. The showing season is nearly upon us, and it's time to cast off winter's dirt, mud and fur and make sure you and your horse are looking tip top. At Bespoke Bandages we have a range of products to help you achieve your best showing sheen this spring and summer. Here are the top 5 products that we have in our kit when we head for the show ring. A smart mane can be the difference between looking amateur and professional. But achieving that perfect plait is easier said than done. A plaiting apron, which contains pockets for bands, thread and scissors, and a built-in pin cushion keeps everything we need within reach when we're plaiting - and avoids the need for 3 arms! Our plaiting aprons come in two sizes - full (with a bib) or half (shown here). Find out more or shop online for plaiting aprons. Smart boots can be a big investment, and they deserve to be kept in good condition. We absolutely love our boot bags for this! The shape is specifically designed for boots, and they are made from robust canvas so stand up to wear and tear. Of course, we have ours personalised for easy identification and to match the rest of our kit! Find out more or shop online for boot bags. It might seem like a small thing, but if you have a fancy browband for showing, it's important to keep it protected. A browband protector is made to measure and has velcro fastenings so you can keep it on right until you enter the ring. We make ours in either soft fleece or a waterproof fabric - and take both to shows with us as the weather is so unpredictable! This image shows a fleece cover on an unusually sunny day! Find out more or shop online for browband covers. 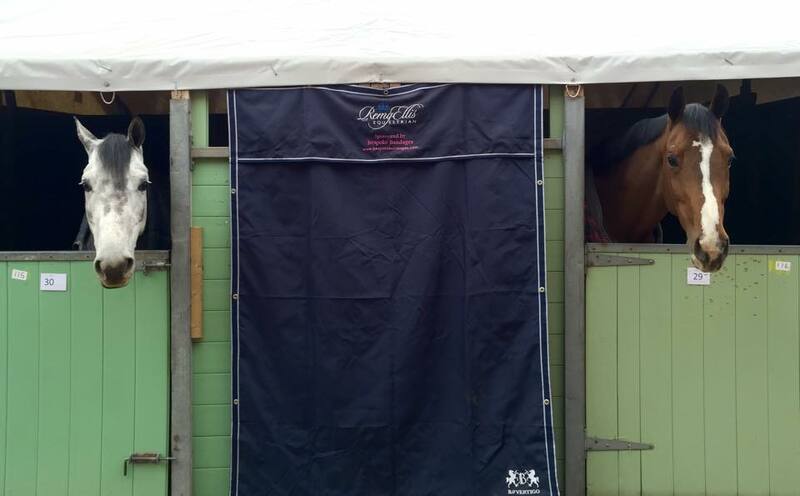 When we head to a show where we're going to be staying overnight, we absolutely love using our stable drapes. These match the rest of our kit and make our stable area look totally cool, calm and collected. Having this professional look around the stables also does wonders for confidence in the show ring! Find out more or shop online for stable drapes. Keeping everything neat, tidy and clean is essential for success in the show ring. We love our set of bespoked, matching, cotton bags. They are specifically made for various items of kit, including bridles and spurs, as well as laundry, so are completely fit for purpose. The personalisation means they can be easily identified, and they look super-professional. Find out more or shop online for personalised storage bags. In our last blog post we introduced new supported rider Remy Ellis, show jumper and winner of the 2014 Hickstead Under 25 Young Rider Final. Remy has been a fanatical rider since childhood, although worked in a marketing role at Benefit cosmetics' head office whilst juggling show jumping on the side, before deciding to quit the day job and work full time with horses. We are very excited about this new partnership, especially as Remy is the first show jumper in our official team! Here, we find out more about how Remy got into show jumping, her career so far and her aspirations for the future. "Having ridden from a young age, I have always enjoyed all aspects of riding. However, it soon became clear that showjumping was my passion." "I have produced my Grand Prix horse Warendorf from a 4-year-old, an achievement that makes me extremely proud, with the added advantage of creating a bond you cannot buy. Unfortunately, he was very ill with colic as a 5 year old and after double colic surgery he is incredibly lucky to be alive. Working with him through a very long recovery period, he defied all the odds to return to showjumping competitively nearly a year later. "He really is a horse of a lifetime, providing me with the opportunity to pursue my passion as a career, something I cannot thank him enough for." "My career highlight to-date was winning the Hickstead Under 25 Young Riders Final last summer. This was the most unbelievable feeling that I have always dreamt of, especially the atmosphere in the main ring on Derby day! I was also invited to jump the Under 23 Young Riders Final at Olympia London Horse Show in December, fulfilling another of my ambitions! Having recently moved full time into showjumping, I have purchased a beautiful 5 year old, Lodewijk Z, to join my team, alongside Warendorf and feel extremely lucky and excited to have two exceptional horses to work with in the coming year." Christmas is the busiest time of for us here at Bespoke Bandages - just check out our Facebook photos and Instagram for some of the amazing bespoke products our customers have created. Plus there are family and friends to catch up with, HGV driving tests to be passed, and it's not like horses are ready to take a back seat and wait quietly in the wings while you get on with all of this! So all in all, the last few months have been amazing, but oh so busy! We've been keeping you up to date on the Bespoke Bandages Facebook page, but thought this would also be a good change to summarise some of our recent announcements and exciting news for the year ahead. Bring on 2015! We've just launched our January sale and also have some special offers to help you make the most of your depleted post-Christmas funds! You can get a set of our super-cool, super-popular bespoke bandages for half price when you buy a saddle pad. Matching, bespoke sets look absolutely amazing. Check out our sets product page for some great examples. We have even more offers on our Facebook page - so if you don't already make sure you like Bespoke Bandages on Facebook, and keep checking the page for special offers for our Facebook fans. We've been working on the website recently to try to make it easier for you to use. We have been focusing on making the product section clearer, so you can see exactly what we offer, how you can personalise it, and how you can buy it! We would love to hear your feedback - let us know on Facebook or send us a comment via the website. Our supported riders are so important to us here at Bespoke Bandages - they help us promote our products, provide really important feedback on our product quality (believe us, Daisy Jackson has really put our bandages through their paces) and offer great moral support! At the beginning of January 2015 we put out a call for people to be involved with Bespoke Bandages on a sponsorship basis. We have been overwhelmed with responses - so thank you to everyone who has been in touch. Meanwhile, supported rider Daisy Jackson has not been letting the grass grow under her horses' hooves! At the end of November 2014 Daisy welcomed new horse Premier Into The Black (stable name Blackberry) to her team. She is now training and competing on Blackberry alongside her existing ride Furst Larkshill (aka Tango), with whom she aims to reach Young Rider level and compete internationally. Along with completing her Advanced Apprenticeship in Sporting Excellence (AASE) and working towards her UK Coaching Certificate (UKCC), Daisy has recently launched her new website. Phew! 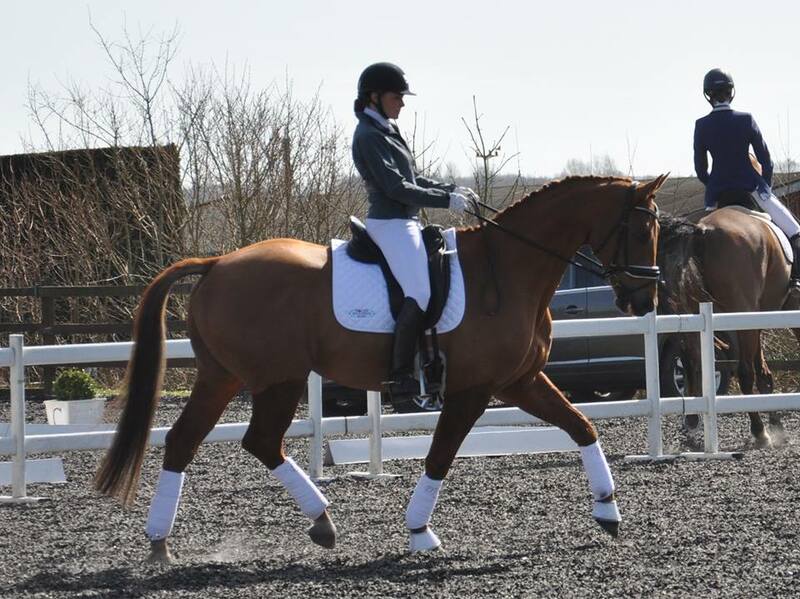 Find out more about Daisy on the Daisy Jackson Dressage website, or via her Facebook and Twitter accounts. ...to our blog! Articles, musings and more from the Bespoke Bandages team.